Greensboro News & Record – April 14, 2018 — The Housing Authority of the City of High Point is exploring potential redevelopment opportunities for the Daniel Brooks Homes property. The Daniel Brooks Homes community was developed in 1942, with numerous investments over the decades that followed. However, given the age and current condition of the property, it is expected that redevelopment would include the relocation of all residents and demolition of the existing buildings. This community currently provides homes for 246 families, most of whom are residents of Daniel Brooks Homes. 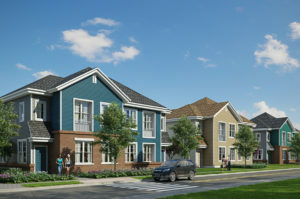 The proposed redevelopment plan is subject to approval from the U.S. Department of Housing and Urban Development and will require financial support from the City of High Point for infrastructure and construction of new affordable housing. If approved, current residents will be provided with various relocation options, including moves to alternative Public Housing communities in High Point or to the private market using a Section 8 Housing Choice voucher. The HPHA will provide financial assistance and oversee the relocation of every household displaced, providing tailored relocation plans that ensure a seamless transition and positive experience. If approved, the exact timing of relocations would depend upon each household’s preferred relocation program, beginning no earlier than the first quarter of 2019, and continuing through mid-2020. After demolition of the existing properties, new mixed-income housing will be built on a portion of site. This housing will provide quality residential options that are affordable to households of varying income levels. It is expected that the relocated residents of Daniel Brooks Homes will have priority to return to the new housing if they choose to participate in HPHA’s Family Self-Sufficiency program. This program encourages innovative strategies that link program participants to additional resources that may lead to employment, increase earned income, reduce or eliminate the need for rental and/or welfare assistance, and make progress towards achieving economic independence and housing self-sufficiency. The HPHA plans to request approval from HUD in the summer of 2018 with a determination of an approved redevelopment plan by year-end. The proposed redevelopment efforts will aid in the deconcentration of poverty, development of new mixed-income housing and preservation of the HPHA’s commitment to provide quality affordable housing in High Point. Laurel Street was approved by the HPHA as a development partner for this and other efforts in 2016, and it will be the master developer of the new community. Laurel Street previously partnered with HPHA to develop Park Terrace Apartments over three phases. “Laurel Street built such beautiful homes at Park Terrace Apartments, so we were confident they would be a good partner to aid us in the transformation of other properties,” said Ms. McGill. For information, visit www.hpha.net or www.laurelstreetres.com.